Two variations of the IMTA approach have been developed in China: suspended multispecies aquaculture, generally in shallow nearshore waters, and multispecies large-scale sea ranching in more offshore and deeper waters. 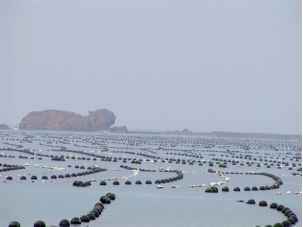 An example of suspended multispecies aquaculture is what is being developed in Sungo Bay, in the East of the Shandong Peninsula. Scallops (Chlamys farreri, 2100 tonnes fresh weight in 2005) and oysters (Crassostrea gigas, 110 000 tonnes fresh weight) are cultivated, on the same long line system, with the kelp, Laminaria japonica (80 000 tonnes fresh weight) (Figures 13 and 14). The cultivation zone extends to 8 km offshore with a water depth of around 20-30 m. The co-cultivation of abalone (Haliotis discus hannai, 1000 tonnes fresh weight) with L.
Figure 13 Large-scale IMTA of scallops (Chlamys farreri), oysters (Crassostrea gigas), and kelps (Laminaria japonica) in Sungo Bay, Shangong Province, China. Photo by M. Troell. 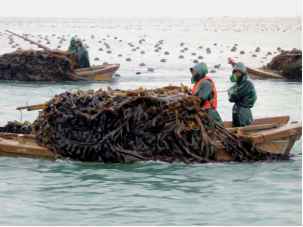 Figure 14 Harvesting of kelps (Laminaria japonica) in Sungo Bay, Shangong Province, China. Photo by M. Troell. japonica is also being developed, with abalones kept in lantern nets hanging vertically from the long lines, while kelps are grown on ropes maintained horizontally between long lines so that the abalones can feed on the kelps by manual feeding. Once the kelps have been harvested, the abalones are fed with dried kelps. An example of multispecies large-scale sea ranching is taking place near Zhangzidao Island, 40 miles offshore in the northern Yellow Sea (water depth from 10 to 40 m). Sea ranching is usually practiced for the enhancement of natural stocks, but the scale and intensity at which it is practiced in some Chinese waters means, in fact, that one is really talking about aquaculture on natural substrates. The Zhangzidao Fishery Group Co. Ltd. is authorized to farm up to approximately 40 000 ha, and presently cultivates 26 500 ha of scallop (Patinopecten yessoensis), 10 000 ha of arkshell (Scapharca broughtonii), 660 ha of sea cucumber (Apostichopus japonicus), and 100 ha of abalone (Haliotis discus hannai). 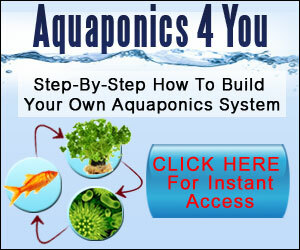 The company has been in existence for more than 10 years. The total harvest in 2005 reached 28 000 tonnes, valued at more than US$60 million (US$18 million in net profit). To improve ecological conditions and the sustainability of the operation, the company is now thinking of developing seaweed cultivation and the construction of artificial reefs in more offshore environments. To date, about 13 300 ha have been optimized in this way. Canadian Shellfish Sanitation Program (CSSP) prevented the development of IMTA because of a clause that specified that shellfish cannot be grown closer than 125 m of finfish netpens. This paragraph was never written with IMTA in mind, but impinges seriously on its development. It is currently being reviewed and amended so that IMTA practices can develop to commercial scale legally, based on recent, reliable, and relevant data and information provided by the IMTA project in the Bay of Fundy and similar projects in other parts of the world. It is also important to note that present aquaculture business models do not consider and recognize the economic value of the biomitigation services provided by biofilters, as there is no cost associated with aquaculture discharges/effluents in open seawater-based systems. Regulatory and financial incentives may therefore be required to clearly recognize the benefits of the extractive components of IMTA systems (shellfish and seaweed). A better estimate of the overall cost/benefits to nature and society of aquaculture waste and its mitigation would create powerful financial and regulatory incentives to governments and the industry to jointly invest in the IMTA approach. For example, Denmark, after the initial development of finfish aquaculture in the 1970-1980s, is now reconsidering more finfish aquaculture development, but the condition for that to occur is proper planning for biomitigation and the recommended use of biofilters, such as seaweeds and shellfish, is being considered. This means that extractive species would now become one's license to operate, or not, in Denmark, and that the nutrient reduction services provided by these organisms would finally be recognized and valued for their ecosystem functions. These services need to be quantified; for example, in Denmark, the cost of remediating 1 kg of nitrogen is estimated at €33. If laws or regulations were implemented to have aquaculture operations responsibly internalize their environmental costs, a significant reduction of their profitability would occur. A study in Chile showed that by integrating the culture of the algal nutrient biofilter Gracilaria, environmental costs of waste discharges are significantly reduced and profitability is significantly increased. The introduction of a nutrient tax, or its exemption through the implementation of biomitigative practices (nutrient credits), would make the economic demonstration of the validity of the IMTA approach even more obvious. Moreover, by implementing better management practices, the aquaculture industry should increase its social acceptability, a variable to which it is very difficult to give a monetary value, but an imperative condition for the development of its full potential. 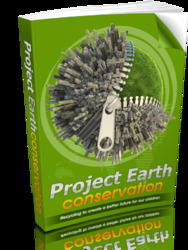 Reducing environmental and economic risk in the long term should also make financing easier to obtain.